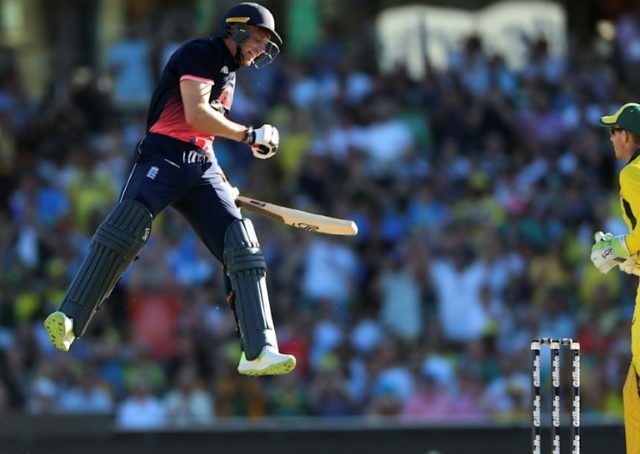 Sydney (AFP) – A scintillating century from Jos Buttler led a late England charge against a full-strength Australian pace attack in the third one-day international in SydneyJos Buttler on Sunday. Already ahead 2-0 in the five-match series, the tourists were sent in by Australian captain Steve Smith and initially found life tougher than in their two previous wins on a slightly tricky wicket. Several English batsmen got promising starts, but it was wicketkeeper-batsman Buttler who helped them post an imposing 302 for six from their 50 overs. Buttler notched his five one-day international century from the last ball of the innings, as England helped themselves to 38 off the last two overs. He faced 83 balls, hitting six fours and four sixes, in a dashing innings that gathered momentum in the last 10 overs. Just as England appeared to be struggling against a full-strength Australian attack, Buttler found a willing ally in Chris Woakes late in the innings, the seamer making 53 from 36 balls in a partnership of 113 in 11.5 overs. Australia recalled pacemen Pat Cummins and Josh Hazlewood for the match, the first time in the one-day series the trio of Cummins, Hazlewood and Mitchell Starc, which spearheaded the 4-0 Ashes win, had been reunited. The tactic appeared to be working until Buttler and Woakes came together. The English were helped by sloppy Australian fielding, with four missed catches and two botched run out attempts. The easiest of the catches to go to grass during the English innings was a howler by Cameron White, who failed to get a hand to a skied chance from Moeen Ali when he was on one. Mitchell Marsh was the unlucky bowler, but had his revenge a few minutes later when he bowled Ali for six, continuing the all-rounder’s wretched tour. Smith dropped Eoin Morgan (41) 18 from the bowling of spinner Adam Zampa, while Starc got his fingers to a tough caught-and-bowled chance. Needing a win to stay in the series, Australia recalled Hazlewood, Cummins, wicketkeeper Tim Paine and Zampa, at the expense, of Andrew Tye, Jhye Richardson, Travis Head and Alex Carey.